People often ask, “when is a good time to look at the stars”. Of course I jokingly answer with a grin, “when it’s clear”. After the chuckles subside, I continue to state, “anytime of year – even winter”. The fear in their eyes when I mention the ‘W’ word, but yes it can be a great time to observe. Each month has their special perks, such as spring time is great for galaxies or the summer’s Milky Way in all its glory which extends into the fall. Canadian winters can be brutal at times and that is the main driving force that locks people indoors from November to April. However if you dress for outdoor temperatures, you can enjoy a couple of hours looking up. Now that winter solstice has come and gone, our nights will gradually get longer. But you still have a wonderful opportunity to step outside with your binoculars or drag out the scope by 6 p.m. local time. And the first familiar sight that awaits you is the mighty hunter – Orion. No matter what part of the world you find yourself in, part or all of the Hunter can be seen. City dwellers battling lights will have no problem seeing the familiar seven suns that silhouette the shoulders, belt and knees. Darker suburban skies are a must to spot the outline of his club to the upper left and shield found on the right. The mighty figure is in defensive mode while battling Taurus the Bull. To say that Orion is bright would be an understatement – it is dazzling. The faintest star of this famous asterism is Mintaka (the right most star of his belt) at magnitude 2.5. One of, if not the most massive star in the sky is orange coloured Betelgeuse. Forming Orion’s left shoulder; Betelgeuse is in its last stages of life. When it decides to explode, it will be as bright as the crescent Moon and would be seen during the day. For now though it is intact. If we were to replace this aged sun with our own, it would be as large as Jupiter’s orbit. Orion has a few good objects to view and photograph such as the Flame Nebula – NGC 2024 or IC 434 aka the Horsehead Nebula, but the showpiece of the entire sky is the Orion Nebula. Known by a couple of catalogue numbers M42 and NGC 1976, this 4th magnitude stellar nursery is a easy to spot with just your eyes. I do not know why Charles Messier did not make this object the top of his list. When examining this fantastic nebula with a low power eyepiece, the challenge is how far can you follow the faint dust and gas as your eye move away from the bright Trapezium area? M42 measures some 45 light years (ly) wide and lays 1,500 ly from us. 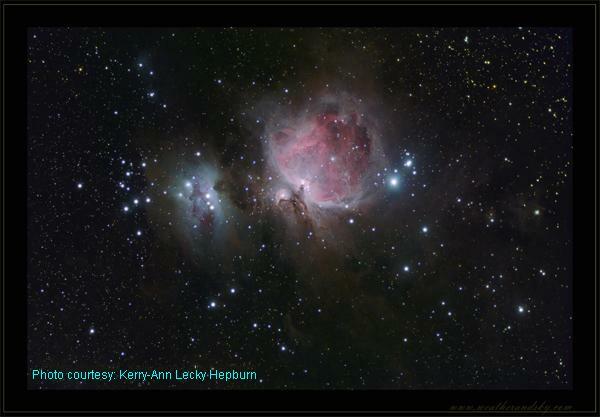 Kerry-Ann Lecky Hepburn has captured the delicate structure of the nebula from end to end, which are referred as the bat’s wings. Next we will take a look at Orion’s combatant – Taurus the Bull. Aldebaran (known as the Follower in Arabic times) shines a little brighter than first magnitude and lies 65 ly away from us. Tipping the scales at 44 times the width of the Sun or 61 million kilometers wide, this orange star is huge. In mythological terms, Aldebaran is the eye of the bull but is not part of the familiar ‘V’ that outlines the head and horns. This starry asterism is actually an open cluster known as the Hyades, resting about 145 ly away. 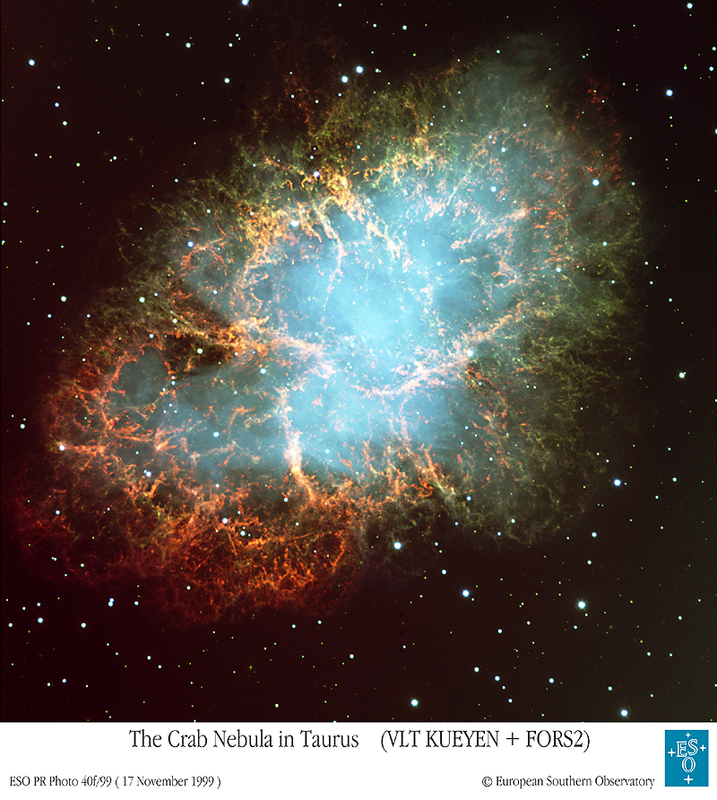 Taurus is also home to Messier’s first entry M1 when he started comet hunting, the Crab Nebula. This is a super nova remnant that occurred in 1054 AD. The pulsar in the nebula is spinning at 30 times a second. Another famous Messier object - M45 the Pleiades forms the heart of the Bull. Looking up from Orion and you will catch the bright star Capella (the She Goat from the Roman era) of the constellation Auriga the Charioteer. Capella is a yellow-white in colour and is ranked as one of the top brightest stars in the heavens. At only 42 light years (ly) away Capella consists of a very close double of yellow stars. Both are about the same temperature as our Sun (5,600°C) and are 80 and 50 times brighter. It will be a challenge to split these two as their true distance mimics the separation of the Sun and Venus. 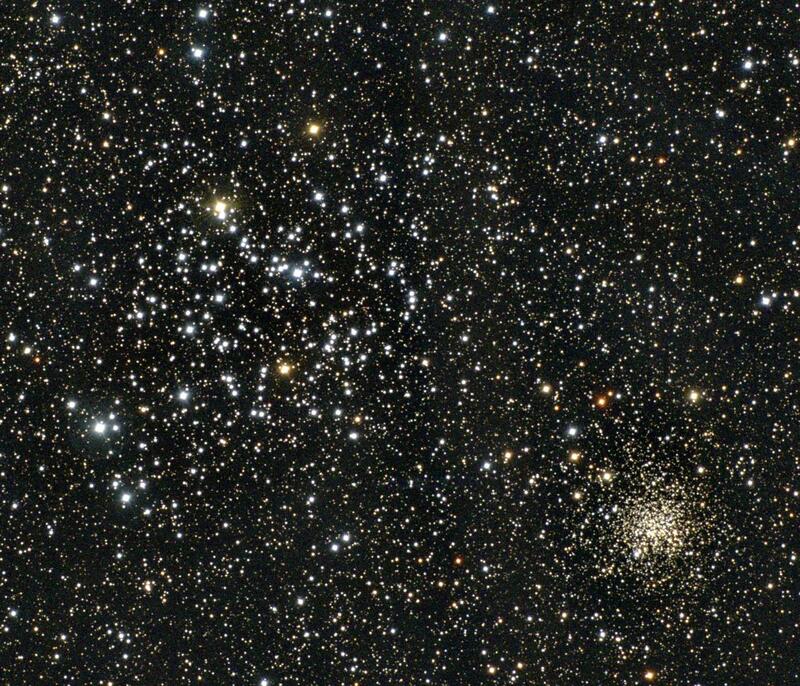 Last month we looked at the many open clusters that live here of which I must mention M37 again. Moving east, the famous twins of the constellation Gemini is now showcased. The bright beacons are named Castor on the right and Pollux on the left. Mythology states these are warriors. And again as we have seen in a few other constellations, Castor is deemed the alpha star although it is fainter than Pollux by a full magnitude. Castor though is a complex system of four and two stars revolving around each other. Pollux is cooler than our Sun and is a K0 giant that plays parent to a planet. Gemini has a few wonderful objects such as the gorgeous and large open cluster M35 at magnitude 5.1 and to its west we have the much fainter and smaller NGC 2158 at magnitude 8.8. A nice wide angle, low power eyepiece will probably squeeze these in the same view. Another gem with colour would be the Eskimo Nebula. Catalogued as NGC 2392, this planetary nebula shows well with medium to higher magnification. Moving south of the famous twins, we find one of two stars that make up Canis Minor. Procyon, with an apparent magnitude of 0.34 is a subgiant star meaning it is now starving for fuel. Procyon, an F5 main sequence star has a white dwarf B component which is considerably fainter. Canis Minor is home to a handful of faint galaxy about the 14th magnitude range. Most of Procyon’s brilliance comes from the fact is lies 11.4 ly away. Curving down and to the left is the brightest star in the night sky. Sirius is his name and is the commonly known as the Dog Star. Mythology states Sirius is the eye of the constellation Canis Major. Both canines belong to Orion. A sharp contrast to the small dog, this constellation has a decent number of observable objects such as the dense open cluster NGC 2362. This cluster has some 60 stars along with the bright O8 star close to the center. A young cluster still sporting some nebulosity and is an estimated to only be 5 million years old. Located 4 degrees south of Sirius is M41. This is a nice peppering of stars and is best seen in binoculars. And to end off our grand tour of the winter sky, we stop at Lepus the hare. Its alpha star is called Ameb and shines at magnitude 2.7. Only Messier object live here and that is the highly resolved cluster M79. At an estimated distance of 47,000 ly, this cluster is though to be home to some 90,000 stars. It glows at magnitude 7.7. For meteor watchers, your turn is coming up on the morning of January 3rd when the Quandrantid meteor shower will be at its peak. This year’s show is best seen in the western portion of North America with no moonlight to interfere. The parent comet associated with the shower is extinct 2003 EH1. Dozens to hundreds of meteor could be seen. A new service from Space Weather is a live radio echoes. So even if you are clouded out, you can still listen online. Now that Jupiter is low the western horizon and is lost in solar glare. It is in conjunction with the Sun on the 24th. Venus is now stealing the nightly sky show. Somehow cold winter nights make it appear brighter. Follow it from night to night till it reaches greatest elongation (highest in the sky) on January 14th when it will be 47 degrees from the Sun and then begins to slide westward. Now the sky begins as the more it sinks, its crescent phase grows and will be very dramatic in a telescope. As January begins, Saturn is up in the east at midnight and two hours earlier at month’s end. The rings are however getting thin as we get closer to the ring crossing event in September when the ring are directly line up to Earth. 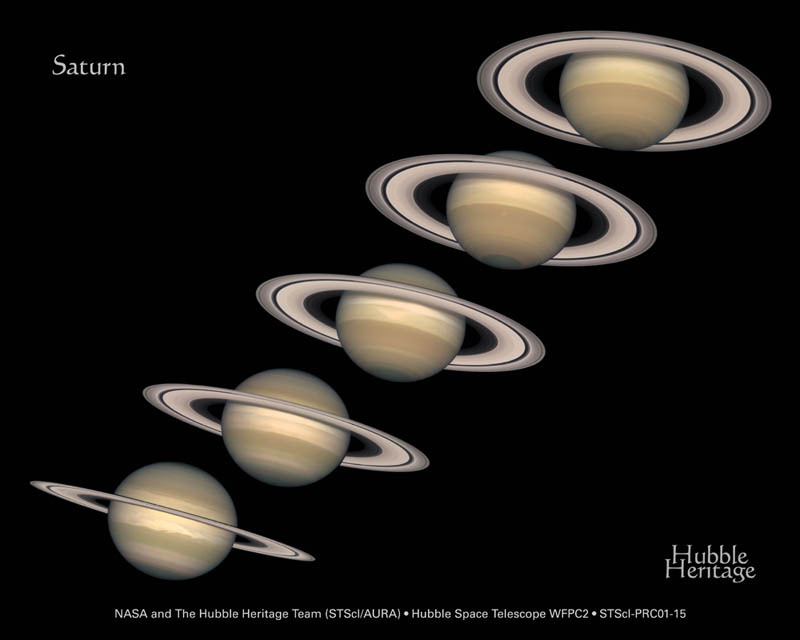 With the rings looking at us, it does make it easier to spot the Saturn’s moons. Then they appear to begin to open over the months and years. This occurs roughly every 16 and 13 years in its 29.6 year orbit around the Sun. Full (Wolf) Moon occurs on the 11th at 3:27 UT. However the day before the Moon is closest so this will be the largest moon for 2009 and or course very high tides. If you are in the South Pacific on January 26th, you will be treated to an annual solar eclipse. The sun will not be totally eclipsed due to the moon’s distance from us as it swings around in its elliptical orbit.